Truth by Kbaig: The War Being Fought within Pakistan!!! The War Being Fought within Pakistan!!! Few days ago Chairperson, Defense of Human Rights and Public Service Trust, Amna Masood Janjua, said something against her routine stance at a Seminar arranged regarding missing persons at Toba Tek Singh that is not new for patriots of Pakistan, however, a special group within Pakistan is claiming this bitter reality as “Conspiracy Theory” and rejecting it just they have been doing in the past and made fun of those who presented such stance. Amna Masood Janjua said, “Indian, American and Israeli terrorist (Intelligence) agencies are involved in the sectarian killings, terrorism and missing persons that are trying to spread terrorism and lawlessness in the country to disintegrate Pakistan”. Is not this a bitter reality, that Pakistan is going through a war from a long time. A war that is not being fought on the borders but within the country in which despite of identification enemy could not be identified. The target of the enemy are not only army but employees of civil institutions as well as innocent children, men, women and elderly. It is unpredictable that from when and where enemy will attack and who will be the target. Neither any it is possible to play siren or take any preemptive measures against suicide bomber as are taken in case of air raid. 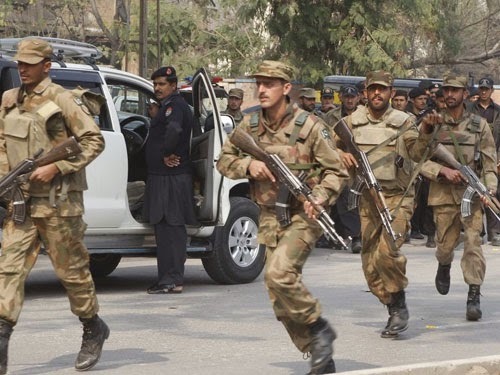 In order to stop him security personnel are deployed; even if the goal of suicide bomber is not to kill the security personnel even than when a suicide bomber wearing dynamite blasts himself, only Pakistanis become the target whether they are wearing Pakistan Army’s of Pakistan Police’s Uniform. The target of the enemy is to create an environment of fear, chaos and hopelessness. If such incidents of terrorism continue for a long time than trust of public over security agencies is shattered while hopelessness and fear in the country hatches hatred among different segments of society. Nation attempts to identify terrorists into the other sects/segments of its own country and thus gets divided; in such a situation propaganda adds fuel to the fire. Even if civil war does not broke out into the country the environment filled with pessimism and chaos paves way for the enemy to achieve her goals because a nation suffering with pessimism is not capable to stand side by side to its army when enemy attacks but shows indifference towards army. This is the first time Amna Masood Janjua has mentioned role of Israeli, American and Indian agencies in deteriorating law and order situation and increasing numbers of missing persons otherwise she had always alleged Pakistani security agencies in the courts discouraging the soldiers fighting for the safety of the public and motherland within the borders facing shortage of required equipment and support from nation. Perhaps this is why Defense Analysts are using the term of 4th Generation War for the war against terrorism being fought within the country; which includes inflation, increasing unemployment, feeling of non-protection, lawlessness, rumors, administrative shortfalls, pessimism, propaganda etc. all are the strategical part of this war; effectiveness of all these weapons depends upon the good or bad governance of the country under attack. Are we fighting and adopting defense strategies as required by such type of war? Let’s analyze it in the light of happenings in the last few days. All of these might seem to be unlinked but in fact they are part of the war waged against Pakistan following a seamless series. How long will this game of blood and death would continue? On 19 Janaury 2014, in an attack on Frontier Constabulary (FC) Convoy at least 22 personnel embraced martyrdom and 38 got injured. According to resources remote control bomb was already installed in the truck that was taking FC personnel in the form of convoy; bomb was blown up when convoy left for Miran Shah from Bannu Cantt. According to a private TV channel explosives were installed in a private van parked in the way of the convoy that was blown up through remote control device when convoy reached near it. 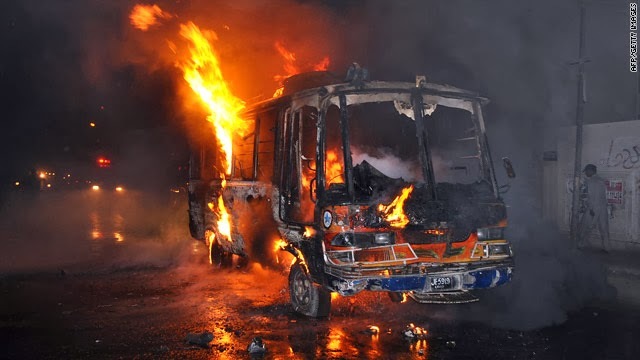 Whether explosives were fixed in the truck of FC convoy or installed in a nearby parked vehicle; it is evident that terrorists were continuously monitoring movement of FC convoy and were present nearby at the time of explosion. This blast was conducted at such a time when govt. and few political parties want negotiations with the Tehreek Taliban Pakistan (TTP) a terrorist organization but TTP despite of being willing to go ahead for peace talks are not ready to stop attacks over innocent Pakistanis and security forces and target killing. This could be easily imagined from the statement of TTP terrorists accepting liability for bomb attack over FC personnel. 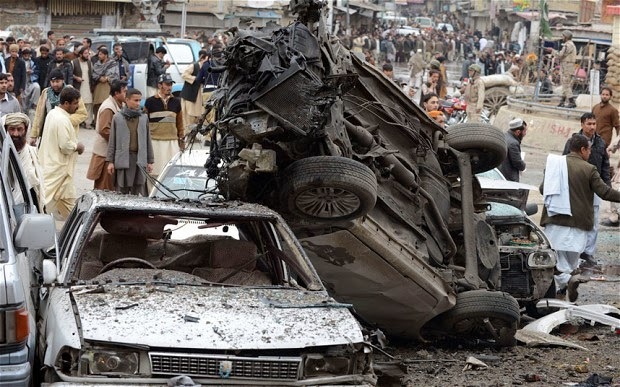 TTP terrorists claim that Bannu attack is revenge of Wali-ur-Rehman’s death and in the upcoming days attacks over security forces would be intensified. In their written message, TTP terrorists addressed to the Pakistani nation that “TTP wants imposition and enforcement of Shariah law and for this they will not withdraw from their (self-devised) Shariah laws and goals. Moreover, drone attacks should be stopped and Pakistan should pull out of American war on terror (while they continue to fight for their CIA bosses within Pakistan). We are ready for serious and goal oriented talks; Pakistan govt. should show its seriousness and power for peace talks because during the statements by govt. TTP’s leadership has been targeted”. As a plan for the future by a suicide bomb blast near GHQ Rawalpindi TTP provided evidence to their threats one day after their written message on 20th January 2014, as a result just like as the main political parties, Pakistani nation also has got divided over operation or peace talks with TTP. One is demanding destructive operation against TTP while other is still pressurizing for negotiations. There is a third group as well that thinks making both ends meet in this ever increasing inflation is also just like the war against terrorism. 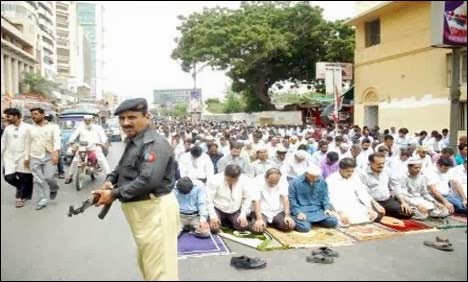 Police guard protecting worshipers in a Muslim country? The division of nation and political parties representing the nation over this issue of terrorism is not less than a tragedy in which the sluggishness being practiced by govt. to decide whether it should go for operation or peace talks is playing a vital role. As soon as govt. took over the power, announced peace talks despite of being aware that TTP conditions peace talks with drone attacks while drones are in the control of America not Pakistan. On 17 January 2014, Khushhal Express (train) enroute to Peshawar to Karachi was sabotaged near Rajanpur through a remote controlled bomb as a result seven coaches got derailed. In this tragic terrorist attack 4 passengers died on the spot while 60 got injured while 5 are severely injured and still fighting for their life. The blast over the railway track was so much powerful that first coach after engine got thrown away in the air for few feet and landed away from the railway track. Out of the remaining coaches six coaches got derailed. 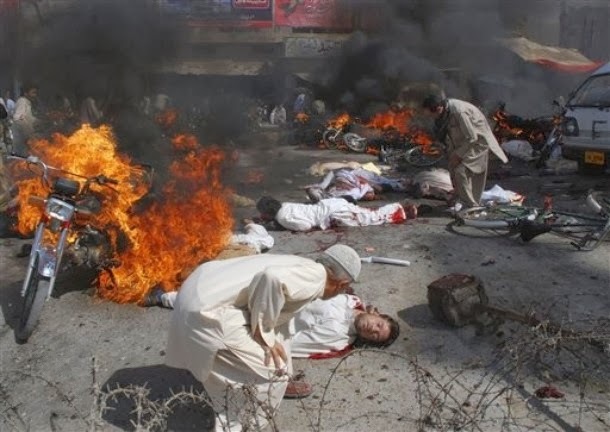 As per usual so-called Baloch insurgents took the responsibility for the blast; leaving behind a question for the self-proclaimed civilized nations providing safe heavens, financial support, training and coverage over international media as well as other forums through seminars in their favor in Europe in order to mould international community in the favor of these terrorists named as Baloch Freedom Fighters by Western forces; are not these Western countries directly responsible for the murder of those passengers who lost their lives, for terrorism against those passengers who will succumb to injuries or spent rest of their life as handicapped persons becoming a burden over their families as well as society? Why Europe and USA are protecting and bestowing these terrorists with weapons and other support? Similarly, remote bomb attack over a preaching center in Charsada near Peshawar in which 10 people lost their lives and number of individuals got injured while offering evening prayers, how many of them would survive or become handicapped; no one is aware of this. However, this is a fact that they were attacked while offering prayers; the attackers and murderers of these innocent worshippers are those who claim fighting for imposition of Shariah (perhaps CIA, MOSSAD and RAW has given them a Sharia in which praying and worshipping God is not allowed). What type of Islam and what type of Sharia they want to impose by attacking worshippers of Allah, worship places of God? On the same day of 17 January 2014, including religious scholar 9 persons became target of target killing; this is a routine matter in Karachi more or less every day persons are killed by the motorcycle riders every day linked to different political parties, police, teachers, security agencies, laborers etc. This process of assassination known as Target Killing is going on in Karachi since long. On 16 January 2014, a DNSG van of a private TV channel became target of bullets of unknown target killers as a result 3 innocents were killed who neither had any personal enmity with murderers nor were they in any way linked with the policy of the TV channel regarding terrorists. They were laborers fulfilling their professional duties to earn livelihood by reporting any tragic incident to the public. This is the main duty or print and electronic media that it should keep public abreast of latest developments in the country. After this tragic incident govt. announced to chalk out a comprehensive plan for protection of all media houses but how will govt. provide protection to media persons when leader of the CID Police Aslam Chaudhary becomes target of terrorists despite of all the security because he was very actively crushing criminals and terrorists.